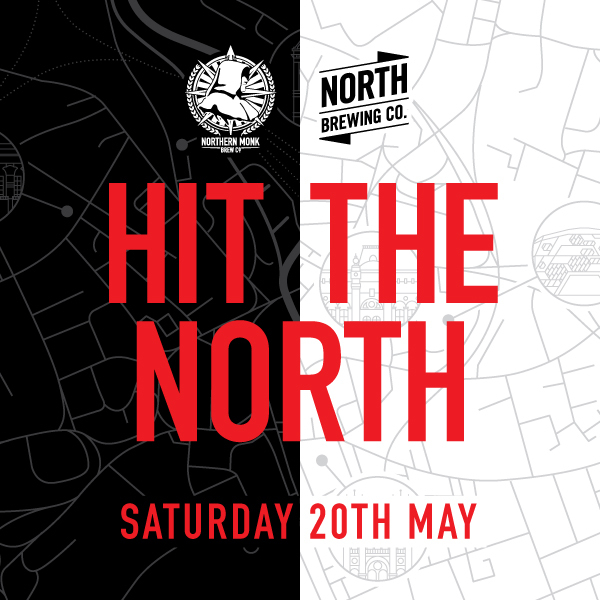 As part of Leeds Indie Food 2017 (11th – 28th May), we have come together with beloved Leeds brethren Northern Monk to present a pair of special collaboration beers, collectively named “Hit the North”, which can be drunk separately or mix together for an extra special tipple. As if that weren’t exciting enough, the two specially designed cans will feature one half of a map, which when placed side by side plot a route between the two breweries, weaving through the centre of Leeds with famous landmarks including Leeds Town Hall and the Grand Theatre marked out as wayfinders. The launch event will also be marked with a joint tap takeover, with brewery’s taprooms showcasing a range of beers produced by their respective collaborators as well as their own. In celebration of collaboration and the wonderful city we live in, the breweries will be putting on a free-to-ride hourly shuttle bus will be on hand to ferry drinkers between the two sites throughout the day on a first-come, first-served basis. Buses will head out from Northern Monk across the city to North Brewing Co every hour from 2pm until 10pm, with the North Brewing Co to Northern Monk leg operating at half past the hour, with street food vendors in operation at both sites. The launch event is listed as part of the festival programme for Leeds Indie Food 2017, which celebrates the independent food and drink scene in the city. Those in possession of a LIF17 ‘passport’ will be entitled to a 10% discount on drinks at both taprooms on the day of the launch. Fran: We’ve heard about the cans, but what was the idea behind the actual beers? Seb: The idea was simple: to brew two complimentary beers we could blend together in the glass. Fran: Nice! What’s the difference between the two? Seb: One is a Black IPA the other is a regular IPA, both have coffee and the same hops. The only difference is that one uses a dark malt…. and the yeast is different too. Fran: What about the fermentation flavours? Is it horseblankety/earthy/musty? Fran: How would you describe the carbonation? Soft, spritzy, sparkling, zippy, gentle? Seb: Yeah, go on then. Fran: What food would it go well with? For example, would you have it with spag bol or a Danish pastry? Seb: Neither. I wouldn’t recommend eating anything with these beers, just chug back one after the other until you feel satiated. But at a push, the pastry.